Viacom CEO Bob Bakish announced the plan, which follows Paramount CEO Jim Gianopulos saying in November that his studio had a multi-picture deal with the streaming service. 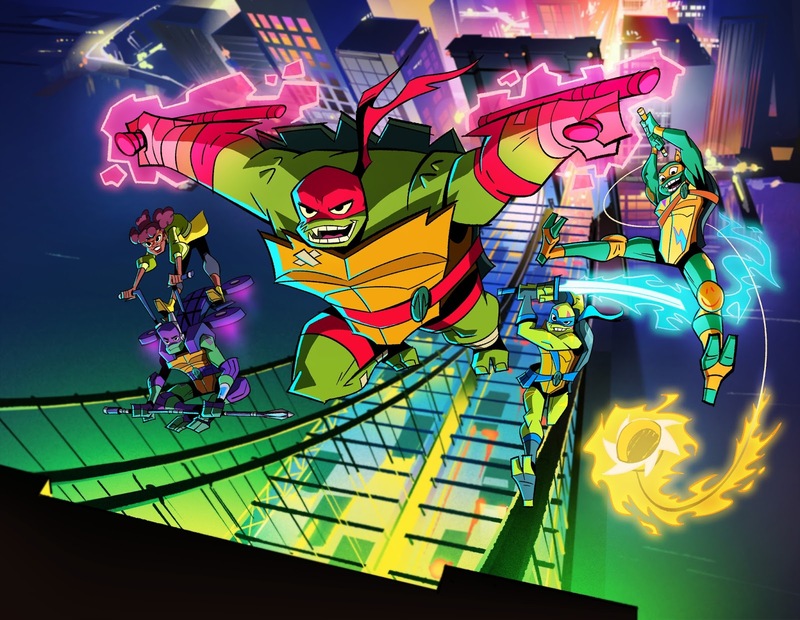 As part of its strategy to generate new content for third-party digital and linear platforms, Viacom has struck a deal with Netflix to produce a pair of original animated feature films based on Rise of the Teenage Mutant Ninja Turtles and The Loud House. Update (4/7) - Nickelodeon Animation Studio is now looking for a people with TV animation and feature animation experience to work on Nickelodeon's upcoming movies which are being produced for streaming on demand! Staff positions currently available are: Production Manager, Picture/Animatic Editor, Lead Storyboard Artist, and Art Director. Visit https://www.nickanimation.com/work-here for the latest Nick Animation job opportunities! Viacom CEO Bob Bakish, during Viacom’s Q1 earnings call with Wall Street analysts on Tuesday (February 5, 2019), said Viacom's Nickelodeon Studios division will produce two original animated movies for Netflix based on the hit properties. The announcement didn’t come with any details about titles, plotlines, voice casts, release dates or crews. Nickelodeon’s Rise of the Teenage Mutant Ninja Turtles. Pictured: Raphael, Michelangelo, Leonardo, Donatello, and April O'Neil. Bakish touted the movie deal as part of Nickelodeon and Viacom's broader efforts to tap into Nickelodeon's intellectual properties (IP) to continue producing new content for digital and linear platforms. “This partnership with Netflix is part of Nickelodeon and Viacom’s broader efforts to tap into Nickelodeon’s library of culturally resonant properties and produce new content for third-party digital and linear platforms,” Viacom CEO Bob Bakish said during the call. Shortly after launching its new cross-portfolio studio production business last year to license and create original first-run content for SVOD partners and other third parties, Nickelodeon inked an exclusive, multi-year partnership with Netflix on animated comedy series Pinky Malinky. Co-created and executive produced by Chris Garbutt and Rikke Asbjoern (The Amazing World of Gumball), the series launched on the streaming service in January 2019. Then Nick cut a second deal with Netflix last September to adapt popular animated series Avatar: The Last Airbender as an exclusive reimagined live-action series that begins production this year. The Netflix movie deal also follows Paramount last month taking The Loud House Movie off its 2020 release calendar. The Loud House, currently in its third season, is Nickelodeon's No. 2 series among its targeted kids two to 11 demographic, behind only SpongeBob SquarePants at the network. The animated show revolves around Lincoln Loud, a boy growing up in a family with 10 sisters. The series remains groundbreaking in its introduction of the kids network’s first interracial married gay couple, Howard and Harold McBride. The GLAAD Media Awards even nominated the series for their inclusion of the characters. 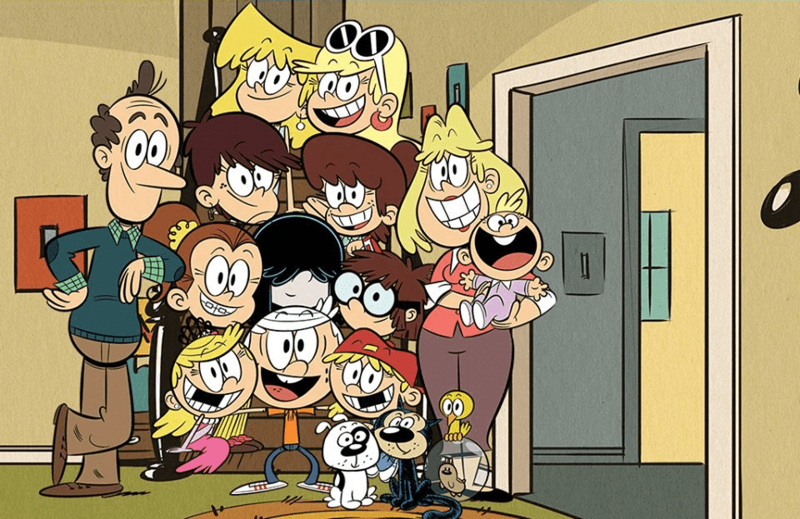 Nickelodeon later this year will debut a new animated spinoff of The Loud House property, The Casagrandes. 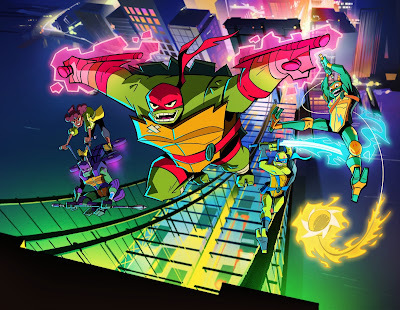 As for Nick’s re-imagined Rise of the Teenage Mutant Ninja Turtles, this 2D-animated action-comedy series is executive produced by Ant Ward and Andy Suriano and bowed last September in the US. It is currently rolling out globally across the kids network’s channels and branded blocks in 170-plus countries and territories, and a second 26-episode season was ordered before the first season even launched. Rise finds the iconic turtle brothers Raph, Leo, Donnie and Mickey, along with their ally April O'Neil (Kat Graham), as they unlock the mystical secrets of New York City. Bakish on the analyst call stressed the two projects were original movies, and not TV series, and billed the movies on Netflix as strong promotion that should drive viewing of the existing Nickelodeon channel offerings. He added that the deal is significant because the deal is only for films and does not involve either TV series. "This is both incremental business and powerful promotion for these two franchises," Bakish told investors. During a Viacom earnings call in November, Paramount Pictures CEO Jim Gianopulos first unveiled plans for a multi-picture deal with Netflix. The Viacom deal contrasts with Disney and Warner Bros. pulling their movies from Netflix to service their own future streaming services. Apart from the new Nickelodeon feature projects, Viacom’s Paramount Pictures division has also become more and more involved with Netflix on various fronts. Its produces high-profile series like 13 Reasons Why and The Haunting of Hill House, which are licensed to Netflix. The film studio last year set an overall deal with Netflix, which took root in the studio’s sale of Cloverfield Paradox to the streaming giant. Upcoming projects under the Netflix arrangement include To All the Boys I’ve Loved Before 2. Teenage Mutant Ninja Turtles has produced six feature films. The first three were released during the franchise’s early popularity, which was largely due to the hugely popular animated series, beginning with Teenage Mutant Ninja Turtles in 1990. Two sequels followed. Teenage Mutant Ninja Turtles II: The Secret of the Ooze release in 1991, and Teenage Mutant Ninja Turtles III followed in 1993. The live-action film series was rebooted with 2014’s Teenage Mutant Ninja Turtles, which was followed by the 2016 sequel Teenage Mutant Ninja Turtles: Out of the Shadows. A third movie is in the works. There has been one Teenage Mutant Ninja Turtles animated feature film, 2007’s CG film TMNT. There was also one made-for-TV animated film called Turtles Forever, which saw the cast of the 2003 Teenage Mutant Ninja Turtles animated series teaming up with the Turtles of the 1987 Teenage Mutant Ninja Turtles cartoon and the original comic book Teenage Mutant Ninja Turtles. To recap other Viacom news, the company acquired US streaming service PlutoTV last month for US$340 million. And it posted lower-than-forecasted revenue—a 1% increase to US$3.09 billion—for fiscal first quarter. Despite the flat result and decreased advertising earnings, filmed entertainment revenue grew from US$14 million to US$621 million, largely due to strong theatrical performances for Bumblebee and Instant Family. To date, Bumblebee has grossed more than US$450 million at the box office worldwide, reinvigorating the whole Transformers franchise. Looking ahead in 2019 and 2020, Viacom’s revitalization of Paramount Pictures will rely more heavily on upcoming kids and family films, including this March’s Wonder Park (formerly Amusement Park) from Paramount Animation. A film adaptation of Nick series Henry Danger is also in the works, as is the third movie installment of SpongeBob SquarePants, which is being overseen by the studio’s newly hired EVP, ex-DreamWorks producer Ramsey Naito. Nickelodeon Studios is a new asset under the kids and family brand’s umbrella. Brian Robbins took the helm of Nick late last year after longtime chief Cyma Zarghami exited the company. The fortunes of Nickelodeon will help shape Viacom’s future, executives acknowledged on the earnings call. They predicted growth in the second half of fiscal 2019 under Robbins and his rebooted team. GUADALAJARA, Mexico — In the world, it would be hard to choose a more exciting figure to introduce a masterclass than Guillermo del Toro, and even more so when that talk is given in the filmmaker’s hometown of Guadalajara Mexico at a festival he has been involved with for its entire 33-year existence. If the audience was excited when Del Toro emerged from the wings to introduce guest speaker Melissa Cobb, Netflix vice president, kids & family, they were absolutely buzzing when he sat across from her to moderate the hour-and-a-half long talk. Del Toro’s “Tales of Arcadia” animated series trilogy is produced at Netflix, as is his upcoming stop-motion feature and passion project “Pinocchio.” The assembled crowd was even treated to a first look at some photos from the project. Early on in the streaming game, Netflix seemingly had their pick of the litter when it came to content for kids and family, one of the three pillars of VOD services along with drama and comedy, and the one often cited as most responsible for limiting subscriber churn. Children’s content represents 9% of upcoming Netflix originals, according to an Ampere Analysis study. But it may now be even more crucial. The U.S. streaming giant’s new kids challenge, at least early second half 2018, was that content from major studios appeared to be dropping off Netflix faster than it could replace it, said Guy Bisson, at Ampere Analysis. In third quarter 2018, for instance, Netflix added 193 2018-produced hours of children & family entertainment. Even so, its total number of K&F hours was 264 down from Q2, Bisson added. The responsibility for handling the content turnover challenge falls squarely on the proven shoulders of Cobb, a former DreamWorks Animation executive whose experience goes back to putting “Titan A.E” into production at 20th Century Fox Feature Animation. Here are five key take-aways from the discussion with Del Toro, and subsequent interview. Cobb explained that whereas history might imply that major studios and studio-heads are locked in a never-ending, polarized competition for box office success, that perhaps need not be the case anymore. Cobb referenced upcoming projects from Oscar-nominated director Nora Twomey (“The Breadwinner,” “The Secret of Kells”), Oscar short-listed filmmaker Fernanda Frick (“Here’s the Plan,” “Raise the Bar”) and celebrated TV director and Image award nominee Nzingha Stewart (“Tall Girl,” produced by McG) as just a few female creators among many who are in key decision-making roles on major productions for the company. The company also working with Chris Nee (“Doc McStuffins,” “Vampirina”) and has a development deal with Darla Anderson. A highlight reel was played during the masterclass which also featured Megan Dong (“How to Train Your Dragon 2,” Elizabeth Ito (“Adventure Time”) and Shion Takeuchi (“Regular Show”). And, while getting female creative talent in the door is important to Cobb, it’s not enough on its own. Netflix’s demand for original kids and family content has never been greater as the company’s subscriber base grows in number and diversity, while some studios are recalling their content. To that end, Cobb explained that the future of Netflix K&F depends not only on in-house talent, but outside co-producers as well. Netflix has sold series rights in countries where the service wasn’t then available and re-run rights to broadcasters in the U.S., but another network producing content with and for Netflix could prove game-changing. “As we look down the road it’s just going to get more and more global over time, so we want to reflect that in our programming,” Cobb pointed out. To that end, Netflix has opened offices in, among other places Amsterdam, Brazil, Singapore, is soon bowing a European Production Hub in Madrid, and will soon be opening offices in Mexico City. She also pointed out that it’s important that new hires in these regional offices understand that their job will be different for Netflix. Experienced TV executives have often spent their careers charged with finding content that will work in their local market, but at Netflix the job is to find content for the world. The company isn’t trying to just bring American TV to the world, its goal is to bring the best international content to its subscribers across the planet. Where Netflix has frequently allowed creators to challenge long-established traditions of narrative and format, the risk-taking in kids and family has been minimal compared to other content areas. That’s likely to change under Cobb. More Nick: Nickelodeon Embarks on New Direction with its Biggest, Most Wide-Ranging Content Slate Ever! Originally published: Tuesday, February 05, 2019 at 5:54pm GMT. Sources: Kidscreen, The Hollywood Reporter; Additional source: Anime Superhero Forum /@SweetShop209, Deadline, Decider, ComicBook, Newsarama, TheWrap, /Film. Abby Hatcher + PAW Patrol Team Up for the Rescue!